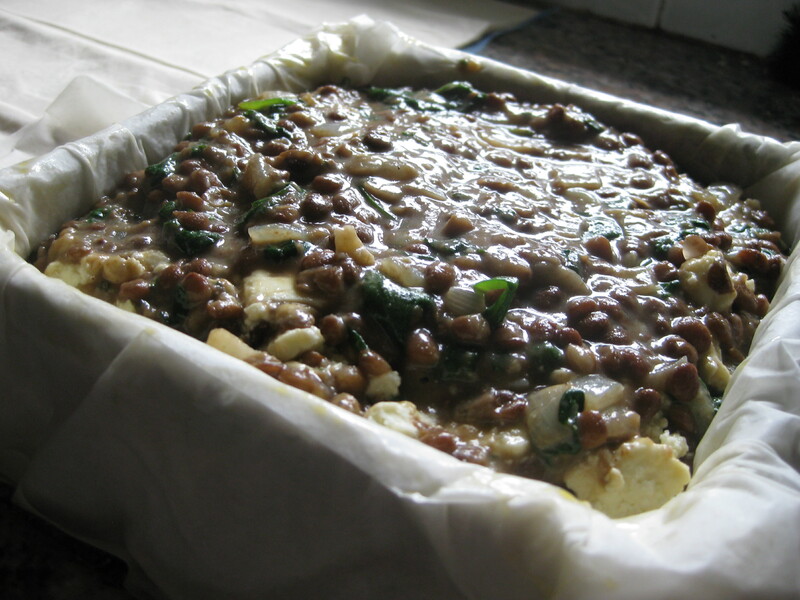 This spinach, feta and lentil pie is one of my favourite things to eat, but least favourite to make, so I usually tend to wait until my mother volunteers to cook it for me when I’m at home. The recipe is easy enough to follow, it’s just the filo pastry that really stresses me out whenever I use it. Perhaps I’m too heavy-handed, but I find that when I remove the pastry from the box it’s already tearing apart, and by the time I’ve managed to separate one sheet it’s completely shredded! Nevertheless, I love filo and use it in quite a lot of recipes, and I decided to give this one a go by myself for the first time in a good few years. It was easier than I remembered, and tasted as good as my mum makes it! 2. Add the spinach and cook until wilted. 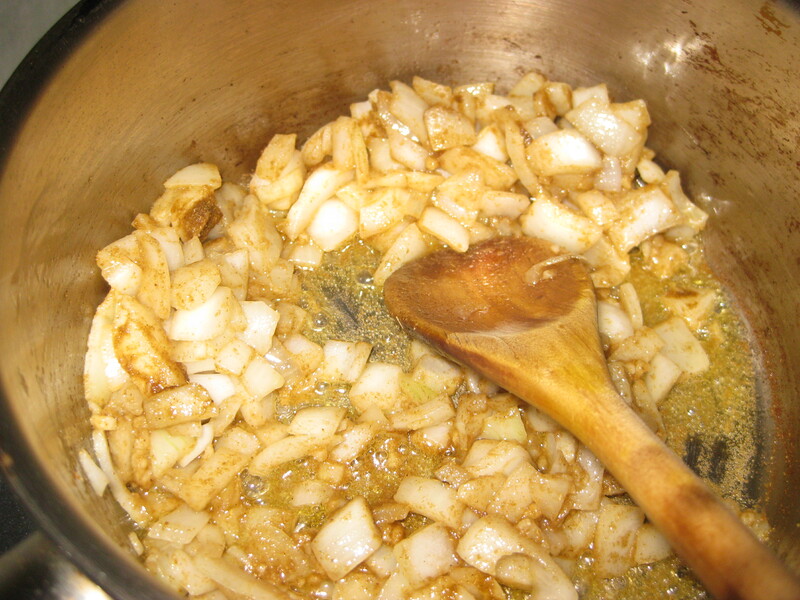 Stir in the lentils and heat through for 5 minutes. Transfer to a bowl to cool slightly. 3. Once it has cooled a little, stir in the eggs, then add the feta, Parmesan and herbs, and season to taste. Mix well. 4. Now for the tricky part – filo time! 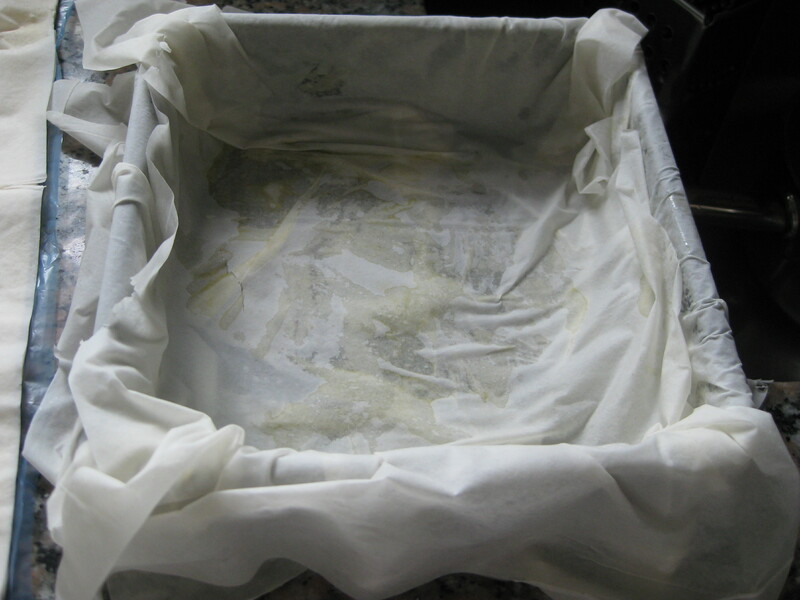 Lightly oil a 25x20cm baking tin. 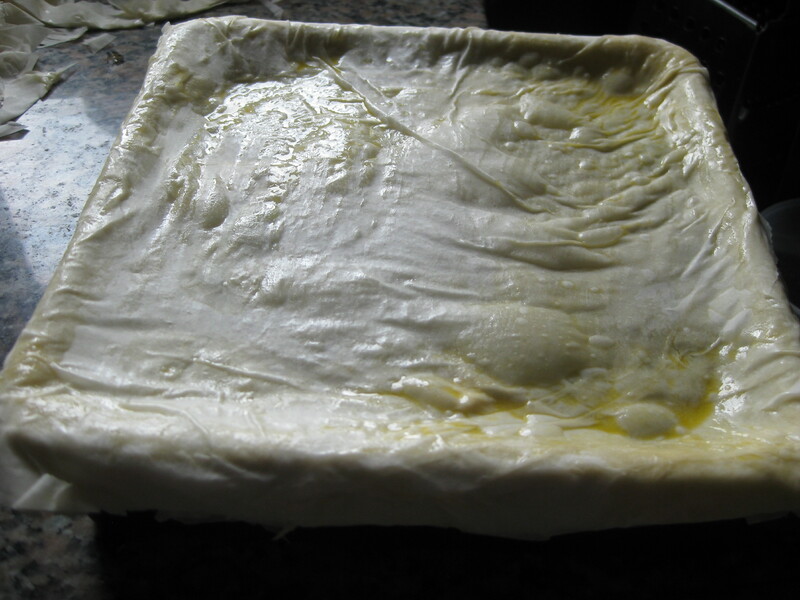 Lay one sheet of filo in the tin and brush it with the melted butter – you’ve got to be fairly gentle to avoid tearing it. Layer five more sheets in the tin, brushing each one with butter. You can either trim the overhang as you go, or leave it till the end, as I prefer. 5. When you have six layers of pastry, spoon in the filling. Then layer the remaining six sheets of pastry on top, brushing each one with butter as before. Again, you’ve got to be pretty careful with this as it tears so easily. Brush the top with butter, trim off any more excess pastry and check it’s all securely pressed down to avoid anything bubbling out. You can use a knife to score a diamond pattern on to the top, if you like. 6. Bake for 40-45minutes until golden brown on top. I’m still getting used to my little mini oven – it had gone a bit too crispy in parts and only needed 30minutes. Leave it to stand for 5 minutes to cool a bit, then cut it up and serve! 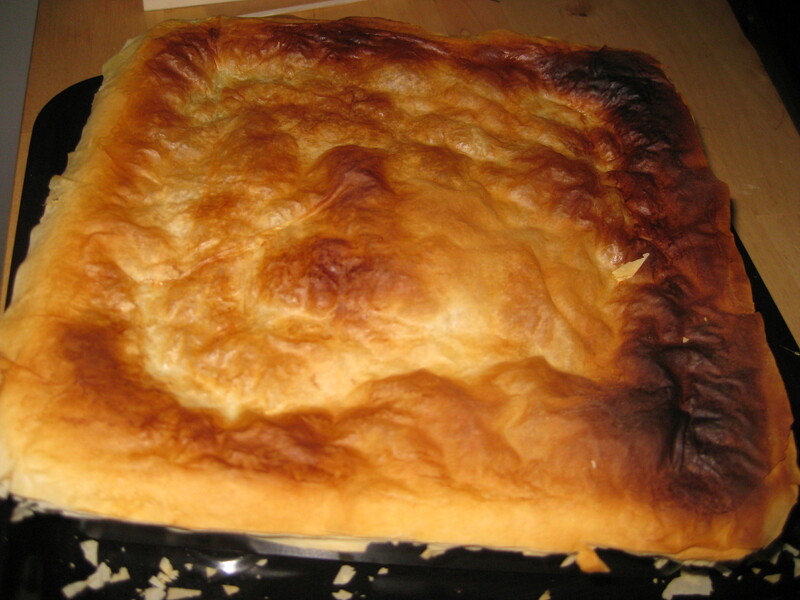 This pie is really tasty and satisfying. I’m a huge fan of pastry in any form, so pie is one of my all time favourites, and it’s nice to get a little taste of Morocco in there too. It makes a nice main meal with salad or potato wedges, but leftovers make a hearty packed lunch too. 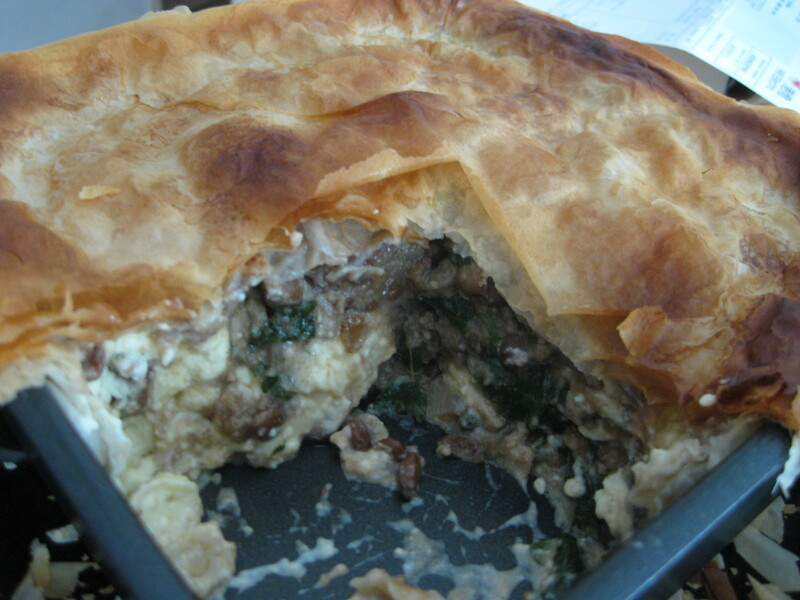 This entry was posted in Vegetarian Recipes and tagged cheese, feta, filo, Morocco, pastry, spinach. Bookmark the permalink.